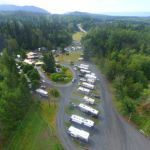 Ask fellow campers about "Elwha Dam RV Park" and nearby attractions. Woodsy, quiet park away from town a few miles. 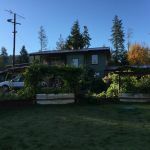 It is run by a delightful couple who obviously love their property, including the garden, which they encourage you to take fresh veggies from. Lots of shade in our pull-through section (some areas do not have shade), and great wifi. We rate it the best in the Port Angeles area. We camped at Elwha Dam RV Park in a Travel Trailer. Beautiful lake nearby, and easy ferry access for a visit to Victoria, BC. Thank you for taking the time to review us! We are so glad that you enjoyed the property and your site. WE feel the people who visit and appreciate it are what helps to make this an enjoyable place. Best journeys to you. This is a delightful & friendly RV park. When we checked in the person at the desk gave me all sorts of information on things to do in the area before he even took any money. The owner was also helpful & friendly. There are lots of trees, grass, & flowers making for a relaxing atmosphere. Many different site sizes & locations. It's also pet friendly. Very clean laundry room in the clubhouse. Our site was pretty close to the people next door but since the utilities were in between that was not really a problem. Our site & many of the other sites were not very level but still manageable. The big rig sites looked newer and were level but no trees although there is grass. The campground has a small vegetable garden & you can pick vegetables for your own use. There are also wild blackberry bushes in the campground. We stayed 4 nights but wish it had been longer. This park seems very busy so reservations are recommended. 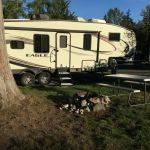 We camped at Elwha Dam RV Park in a Fifth Wheel. Easy access to Olympic NP & many other sights along the Strait of Juan de Fuca. Thank you for taking the time to review us! We appreciate it and also our customers, like yourselves, who help to create the great atmosphere that we have. Best journeys to you! As noted in other reviews, this park has some issues. However I would stay here again because the owners are great, helpful and really care about their RV park. And the Wi-Fi was the best RV park wifi we have had in weeks. We had two sites because we booked late and had to change sites to stay through the Labor Day weekend. First site was #2, a full hook up site. It was tight for our 40 footer and had a slight crown slope. I needed a few 2x12's to level. (The utilities worked well.) We could extend slides but not the awning. We relocated to site 6, which is group site, and we met a few other RV'ers while we were there. It was dirt/ gravel and mostly level. When we left, the manager suggested we use an empty pull through to dump instead on maneuvering to the dump station. Worked perfectly for us. The office had a good selection of free DVD's too. We even contributed a few when we left. The owners maintain a garden and offer anything they grow to campers without charge. (Cherry tomatoes were ready for us!). The laundry room is part of the lounge area and clean, $2.50 loads. We didn't use the other amenities at the park. The office staff was helpful with directions and other points of interest in the area. The park is tight but interior roads have ample room for big rigs. Access to the park is easy via state highways too. We camped at Elwha Dam RV Park in a Motorhome. This park is perfect for visiting the Olympic Pennsula. Olympic National Park is close, Neah Bay has a great Makah Museum, about 1.5 hours away. Cool 1910 store in Joyce, 30 min drive on the way to Neah Bay. Cape Flattery is about 20 min past Neah Bay. Hoh River rainforest, part of Olympic National Park is about 2 hours passing thru Forks on the way. Ferry to Victoria Canada leaves from Port Angeles, about 15 min from park. Thank you for your review, we would normally put your size in our upper area 70x30 pull throughs, but glad we could accommodate when they were full. Site maintenance is an ongoing process in region that gets heavy rains at times, but we have finally bought a tractor and are working on extending and leveling all the sites as the need arises. If there are more ways we can increase the value of your stay, we would love to know. We'd love to see you again. Best journeys ahead. This campground is tight to drive through and maneuver around in. Sites are fairly level with the utilities placed well and in good working order. Some sites have lots of trees and some have no shade. I felt overall it was an ok park that was over priced. I camped here in a 40" motorcoach. We camped at Elwha Dam RV Park in a Motorhome. Nice, privately owned park just outside of Port Angeles and not far from one of the entrances to Olympic NP. Very friendly in the office where I was given an area map and a great list of things to do in the area. We had one of a group of 12 pull thru sites (41-52) that gave us plenty of room for 36' 5th wheel and truck. There are some other pull-throughs that aren't as long or not as easy to get in to. Our satellite worked great from this spot in the park as well. We would definitely stay here again. 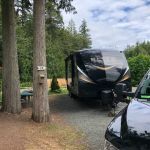 We camped at Elwha Dam RV Park in a Fifth Wheel. Olympic NP-Hurricane Ridge (good hiking trails at the visitor's center and fantastic views; Hoh Rain Forest was beautiful. Drive out to Cape Flattery-beautiful! Salt Creek Rec. Area-go at low tide and explore the tide pools; we found sea stars, anemones, small crabs, and a family of 4 otters were swimming right by us. Lake Crescent is a beautiful glacier lake-took a hike and had lunch by the lake. There is a lot to do in the area-grocery stores and Walmart close by if you need to restock the RV. Thank you for your review! We are thankful your stay worked out well for you and that you got to see some of the amazing things around us. Hope you can come back another time. Safe Journeys ahead for you all! We used this campground as a base to explore Olympic National Park. The campground hostess was extremely pleasant and willing to help out in any way possible. Our site was roomy enough for us. I did feel that most of the lower numbered sites felt "homier" than the higher numbered sites. The owners of this campground obviously spend a lot of time putting in personal touches, which most certainly add to the overall feel of the campground. Examples-there is a garden, from which you can take food, a free dvd lending library at the office, and oodles of wooden statues scattered around the grounds. Also, there is a strong internet connection. The laundry room was huge and clean, as were the bathrooms. 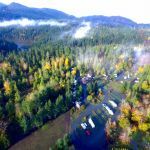 This campground is about a ten to twelve minute drive to Port Angeles and the Hurricane Ridge entrance to Olympic National Park. We camped at Elwha Dam RV Park in a Motorhome. Thank you for your review. We are so glad you enjoyed our amenities and your stay. We were glad to have you. We wish you the best travels ahead and hope we can see you again another time! I am very sorry what you describe. And you are right, it doesn't make sense because we don't have any RV sites like that, only a couple tent sites that we will to RV's who want to be here and enjoy a tent site fee. In those sites we do have a heavy duty commercial 30 amp longer cord from a nearby pedestal for those who have Cpaps or really need power, but those sites are $37.00 before tax. As always, if we have the opportunity, we would happily make up the lack of value you felt. Hope you come again so we can make it right. Our site was # 10 and backed up to a forested area. Sites were close, but we had privacy as no one was behind us. This place offered pet sitting which was invaluable to us - couldn't take the dog everywhere so we took advantage of this 2 days. The dog sitter even sent me videos of the dog throughout the day to let me know she was OK. Provided info on local sites to see, clean showers, bathroom and laundry room. Lots of stuff for kids to do - basketball court, volleyball net, etc. Would stay here again! We camped at Elwha Dam RV Park in a Travel Trailer. Thank you for your review and glad it worked out ok for you. We enjoyed having you! Our sites 17 wide to 44 wide depending on the ones you are in. We hope you have a great journey ahead. Very nice people at a very nice park. Due to an RV problem we had to change our reservation and could not get a site with full hookups. Still, I would like to visit this park again. There are a number of pull throughs and back ins. No sewer at our site but it is available at other sites and they have a dump station. Free DVD loan while at the park. We stayed 3 days and enjoyed it very much (they even have dog sitting $$). 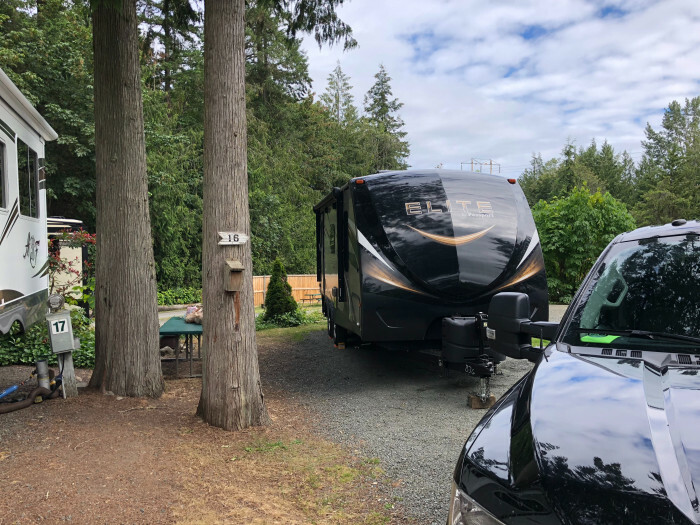 We camped at Elwha Dam RV Park in a Fifth Wheel. Overall this is a good campground. The sites were a bit close together, especially where we were. Our site (16) was big enough for the camper, but was difficult to park the truck. We were able to fit in right in front, but it was a bit of a game of "Tetris" when everyone was there. There was a large room with laundry, a small kitchen and a TV. It was a great space if you need to do laundry, but there seemed to be a lot of people using the kitchen. I think there were a decent number of long-term residents, but it seemed that most of them were in the back. The bathroom was clean. WiFi was ok at times, but not great or consistent. We might stay here again if in the area, but would probably review other options first. We camped at Elwha Dam RV Park in a Travel Trailer. Hi there, Thank you for your review. Occasionally "Tetris" can happen on busy summer weekends, but we aim for the opposite :) Also, wanted to clarify, most like the kitchen got used by other visitors or tenters. Out of our 90 sites, we actually only have 9 sites with people on monthly basis. 3 are work campers and others are traveling nurses, people building homes etc. They all have their own cooking facilities. We had a grassy tent site under the trees, not too far from the very clean bath room. The laundry facilities were in the community room with tables and a large screen TV. The hostess were friendly and welcoming and provided lots of good local information. Very convenient for both Port Angeles and Olympic National Park. Would stay here again. We camped at Elwha Dam RV Park in a Tent. Thank you Leslie! So glad that it worked out for you and we would love to have you again!Happy camping to you! Very pleasant place to stay for a few days. Great staff/owners, who are happy to help with pretty much anything. Dog walking available for reasonable fee. Vegetable garden open for all to pick what they would like. Play areas for kids, picnic tables and fire pits. No cable. Some sites have ability to get satellite, ours did not. Antenna brought in 4 channels, but they have a large DVD library for free use. Free wifi was slow but useable, cell reception was fine (Verizon with booster). The pull through sites in our section were mostly very close. We had an end site, with a small patch of grass on a hill and lots of close traffic going by. A bit uncomfortable to sit outside on a slant with campground traffic and kids riding bikes, etc., just a few steps from our seats. We did so the first few days/evenings but tired of it towards the end of our stay. Overall, we would stay again but would probably request a pull through in the back of the campground. We camped at Elwha Dam RV Park in a Motorhome. Olympic National Park is nearby with Hurricane Ridge a "must see" and hiking to Hurricane Hill is spectacular. Port Angeles is okay and Port Townsend is worth a visit. Plenty of shopping and restaurants in town, plus a ferry to Victoria, BC. Hi and thanks for the review! Safe travels ahead and we hope to see you again! Very nice park, Excellent hosts, Nice long pull through sites, no cable tv, satellite tv is easy to get with no obstructions in our site. Only problem we had was the person that was in our site seemed to forget he was to leave that day. We had to wait about an hour for him to vacate. I would have thought management would check their park to be sure our site was clean and vacated by check out time. Other than that we would certainly recommend this park to anyone that would like to stay in the area. They also provide dog sitting which in my opinion is an excellent service for those who need it. 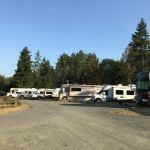 We camped at Elwha Dam RV Park in a Motorhome. Hi there and thanks for the review and sorry for the confusion. We do check sites and clean sites in between but at same time, we also work hard to accommodate requests for early or late check ins. When we do this sometimes it leaves us with a little less wiggle room to catch an issue. It isn't a regular thing and we were also surprised. Sorry again. 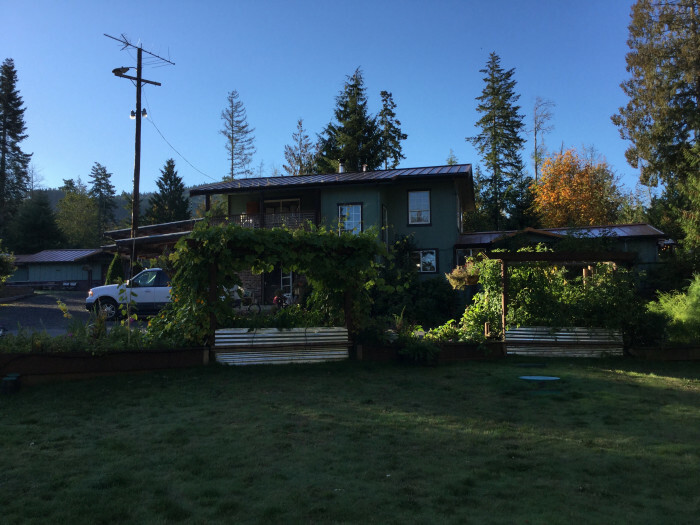 A well run operation, clean and well maintained with close access to Olympic NP. Onsite owners have a good handle on the business. Facilities were extremely clean. There are a number of long term trailers but they are clean and maintained. A more typical commercial park in a tourist area, close sites at a premium price, if you want play you are going to pay. 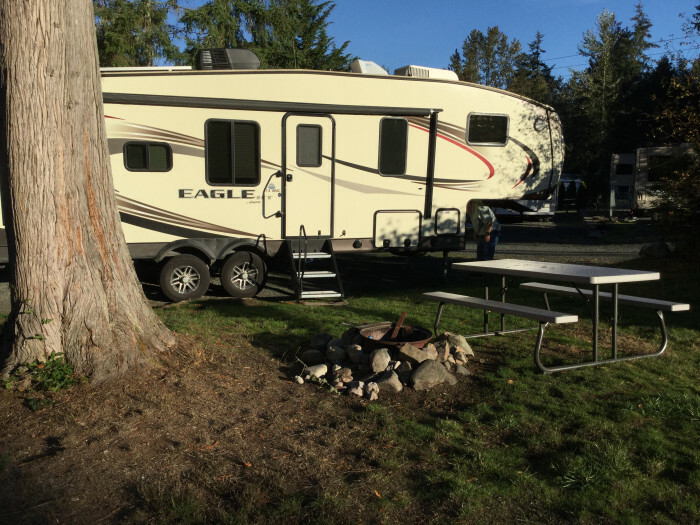 We camped at Elwha Dam RV Park in a Fifth Wheel. Thank you for your review. We are so glad that you got to come to this area and experience the wonderment around us. Real Estate has driven costs up, but we are happy to be here. Very nice place to stay with extremely friendly people!!! Some excellent long level pull throughs; back-ins that can be a little close and maybe tight, nice grassy tent sites. CLEAN showers and laundry room!!!!! No cable and couldn't get a station on the antenna, but there was a rather large free DVD movie library! Free WIFI was available but not always reliable but Verizon phone signal OK. A few miles west of Port Angeles but easy access in to town. Would definitely stay here again!!!! We camped at Elwha Dam RV Park in a Motorhome. Thank you for your review. So sorry you couldn't find a station on your antenna. We get a few channels on regular tv, but every RV is different so its hard to know why it didn't appear for you. Wifi is currently being upgraded (an annual event :) ) so we are excited for the reach and strength to increase. We enjoyed having you here and wish you the best ahead ever! Chris for the Elwha Clan. Check in the Visitor's Center to see if it's clear at the top of Hurricane Ridge. Great drive and marvelous views. We drove to see Cape Flattery and hike the Shi Shi trail (very muddy in spots). The museum is very good. Dinner at the Breakwater in Sekiu was delicious. Long road to Neah Bay but great payoff. Breakfast in PA at First Street Haven was delicious with homemade pastries. Marvelous waterfront walk. Sarai Thai restaurant in PA is awesome. Bella Rosa Coffee Shop has the best crepes and coffee and are very friendly (on Lincoln St in town Port Angeles). Hurricane Ridge in Olympic NP is easy to get to and hike. Cape Flattery is a do not miss if you are in the area, but a windy coastal drive--do not take your RV. Near all kinds of outdoor activities with Olympic National Park is nearby with three temperate zones. Ferry service to Vancouver Island is minutes away. Take a trip to Victoria on Vancouver Island, 90 minutes from Port Angeles. Don't miss the beautiful Hoh Rainforest area in Olympic National Park. Loved Hurricane Ridge, Ediz Hook, Dungeness Spit, Hurricane Hill, Klahhane Ridge hike. Enjoy Sol Duc Falls but skip the Hot Springs. Crowded and dirty water. Loved Costco in Sequim. Had to use the walk-in clinic in Port Angeles and it was excellent. Just opened Jan 2017 and next to very nice hospital. Thought the 2 hour drive out to Cape Flattery was not worth it. 5 or miles west of Port Angeles, so easy access to the HOH Rain Forest, Olympic Forest, 1 hour to Port Townsend. Highly recommend them all. Everything is just so laid back, can't say enough about this area. Definitly coming back. This park is on west end of Port Angeles. Good location to visit Cape Flattery, Lake Crescent, Sol Duc falls & hot springs, Hurricane Ridge Rd., as well as Port Angeles. I. Convenient to the Olympic National Park and peninsula. If you go to Crescent Lake stay on 10 and not 112 to visit. Lots of rain in September and October. This is in the woods so reccommend you carry bear spray. Use a surge protector and multimeter to check your electrical connections. Some construction on the west end of route 112. May need blocks to get level. Check out the beach at the end of Place Road (go to end, turn right, and take first parking space you see) and walk to the beach which has mounds of driftwood. Neah Bay to reach the most western point of the continental US and the Makah Indian Museum. Anything on or around Lake Crescent, the Hoh rain forest has a couple of easy trails. Very informative as well. Hike to Marymere Falls. Take a day trip to Hurricane Ridge for some spectacular scenery. On day trip to Cape Flattery, definitely visit the Makah Museum in Neah Bay. Sabai Thai restaurant is excellent! Get the White King Salmon in red curry sauce special. Must go to Hurricane Ridge and do at minimum the Hurricane Hill Hike....if you are in good shape, do the Klahhane Ridge one. Amazing views from both!! If you are coming from north of Seattle, take the ferry from Coupeville to Port Townsend and save yourself a lot of time and aggravation by avoiding the Seattle/Tacoma traffic. Make a reservation though, the ferries are busy. This is a nice park in the Port Angeles area. It was a nice base camp for exploring the Olympic Peninsula. This park is near the old Elwha Dam site where an informational kiosk has been located. It was raining so we did not visit the dam removal site. Port Angeles is a short distance away but we did not spend any time there other than to catch the ferry to Victoria, BC. Elwah Dam site, Olympic National Park, Cape Flattery. 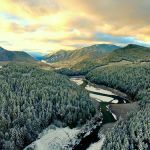 This is a perfect location for visiting Olympic National Park. Safeway and Haggen in town; Walmart just outside of town. Try Granny's (a few miles west) for cheeseburgers and breakfasts. The campground is just a few miles from the entrance to Olympic National Park's Hurricane Ridge area. If you go, try to wait for a clear day! It was hazy and humid when we went so the views were not as clear. Access to Olympic National Park is close by, ferry to Canada, downtown Port Angeles, Safeway, Super Walmart close by. Enjoy a nice meal at Toga's Soup & Deli just a few miles away. Enjoy the Olympic National Park and beautiful Crescent Beach not too far away. 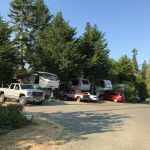 Are you affiliated with Elwha Dam RV Park ?